In 1920 at the Chicago American Numismatic Association (ANA) convention, ANA historian Farren Zerbe was the person who originally suggested for the minting of the Peace Silver Dollar. Zerbe presented a paper, "Commemorate the Peace with a Coin for Circulation." Farren Zerbe proposed a coin which would commemorate the end of World War I and the new peace treaty signed between Germany and the United States of America. At this time, the US was also minting Morgan silver dollar coins. 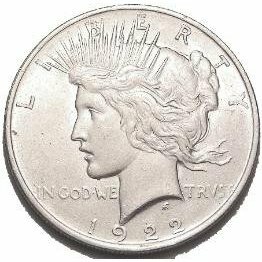 In 1921, the Peace Silver Dollar coins were minted in Philadelphia and were produced every year until 1928, taking a break until 1934 to be produced for another two year. After 1935, these coins made a brief comeback in 1965 where approximately 316,000 were minted in Denver Colorado. Unfortunately due to American politics of that time and shortage of silver, this new production of coins ceased and were ordered to be melted. According to some rumors among collectors, a few may have survived. The term "mint" refers to the coin's origin or place of production. Determining the mint is a simple straightforward process as these coins were manufactured in primarily three regions. 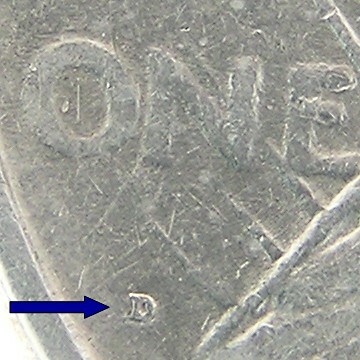 Underneath the word "one" on the tail of the Peace silver dollar coin, you can find the mint marks: D is for the Denver mint and S for San Francisco Mint. Philadelphia coins do not have a mark. The production of these coins took a break after 1928. Silver interests renewed once more during the Great Depression of the early 1930's with the success of a campaign directed at staunching the deflationary trend by rejuvenating currency values to the level at which wartime and postwar debts had been reduced. Besides the diminution in the gold content of the dollar, limitless mintage of silver was finally authorized. In 1934, Peace Silver Dollar coins resume production, but only for another two years before ending production for almost three decades. In 1964, President Johnson ordered the minting of 45 million brand new Peace Silver Dollar coins. However, these coins did not complete production and never made circulation. A few that were produced were melted by order of Congress due to the Coinage Act of 1965 which mandated the removal of silver from new present day coins in circulation.